Some of my favorite childhood summer memories are wrapped within books. The summer before sixth grade I spent doodling and imagining hot air balloons thanks to Twenty-One Balloons. Agh, and I can't forget the summer I read Old Yeller for the first time. I was so shocked by the ending. Having the time to soak in a good book is a real joy around our house, and I'm doing all I can to make sure that my kids have time and space to make reading something special. C had her first bookclub meeting last night, and she was excited to talk about her book with friends. Ramona Quimby, Age 8 is up next, and I'm looking forward to her enjoying all of Ramona's antics. I'm traveling around a bit this week to visit some wonderful blogs, and today, I'm over at The Happy Family Movement. They have an awesome summer bucket list challenge going on, and I had to join in when Jenny put out the offer. Take a gander at some of the wonderful ideas they have over at The Happy Family Movement for a blissful summer! I'm all about this here blog helping my real life and yours be a little bit or maybe even a whole lot better. However, this new once-a-month series is really all about me. Well, sort of. And by this I mean, it's all about my relationship with my eldest, M age 7, and her sense of learning and literature. And it's about having healthy, life-giving parent-child relationships and finding meaningful ways to connect with the most important people in our lives. And so maybe it's about you, too. Remember how I started up a bookclub for M over the summer? Check out this post to find out how you can create a bookclub for your child, too (it's really not so tough to do). We had a ton of fun with her friends: reading, crafting, and eating together. Now we're in the thick of the school schedule that for us means lots of academics, choir, ballet, Brownies, and a whole bunch of other busy. But she's still my little girl, and I want to have special time with her (and her siblings, too). I'm also a teacher by training, and I know how critical it is to read at home. If you're looking for some great tips to encourage a passion for reading in your kids, head over to Sandra's blog...it's a great resource. M and I were looking through summer photos and rehashing the fun we had together, and we decided we should do more bookclubs. But fully knowledgeable of our already-rainbow colored Google calendar, I suggested that we make it a bookclub just for the two of us. 1. We read one book a month. We get two copies of the same book when we go to the library together, and we have to both be excited to read the book (AKA Mommy cannot force me to read a boring chapter book with a bad cover). We go to the library most Fridays (to get movies) and Saturdays (for special Daddy time) so we have easy access to the best choices. This means that I get to dive back into some children's literature that captivated me. AND that I need to be equally enthusiastic about reads that M loves... like our first choice, Meet Kit, an American Girl historical fiction. It's set in the 30s and 40s which opens up all sorts of great conversations about the world as it was! 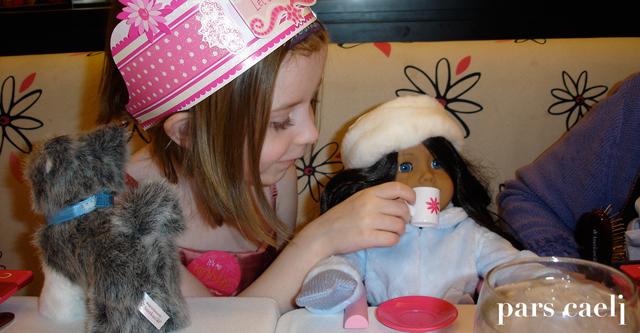 M spent her 5th birthday at the American Girl megastore in Chicago having a festive afternoon tea (see above), and she's been interested in the historical books for a while. 2. We wait to talk about the book until our "meeting". M is very much excited about a special designated time where we can sit together somewhere other than our house and talk. I am super aware that this desire is likely a fleeting one so I'm soaking it up while I can. I imagine most of our gatherings will be at a local bookstore or coffee shop so that we have some girl time away, too! 3. We watch or craft together based on our stories. Most of the books we've chosen have been turned into movies. I always love to dish about who would play which characters in the movie versions of our books for my grown-up bookclub, and I know that M will have great ideas on how the books do or do not mesh with the films. If time so allows, we'll skip the movie idea and instead create something together based on our reading. M already has some ideas brewing for Meet Kit and its historical context, but I also want to be realistic about how much time we'll have to delve into a project. I anticipate my biggest challenge to be her brother and sister who at 2 and 5 will also want a bookclub just for them...so I'll just have to turn that challenge into something else good! Have you ever read alongside your children? Any helpful ideas to share? I've been a proud member of a wonderful bookclub for the last five years or so (did you see the Hunger Games night that I hosted...memorable and delightful), and my daughter, M at age 7 has always been intrigued by the idea of reading and eating together with friends. To keep her excited about reading, I suggested that we could gather a group of her friends and explore some chapter books together over the summer. I had to throw in a craft and some delightful treats to seal the deal, but I didn't really need my arm twisted. Soooo, I had this crazy idea that borrowing a chocolate fountain, melting 4 pounds of milk chocolate yumminess in it, and inviting over a handful of 7-year olds would be fun. I was right. And I was exhausted post event. Starting a bookclub with your child allows you the opportunity to connect and to educate, and it sets a great tone for future learning. Your child sees that you embrace reading, that reading can be and is fun, and that reading shared with friends enhances relationships and knowledge of ourselves. Keep it small to start off. Where possible know the parents, too. This size of club makes it easy to have more in-depth discussion and allows the kids to be able to listen to one another's ideas without being overwhelmed by the numbers. 2. Get the parents involved. Though I'm a teacher by training, I still wanted lots of input from the other parents of kiddos involved in the bookclub. I sent out an email with 5 suggested chapter books (with Amazon links) and asked each mom to pick two that seemed like good reads for their girls. We decided on two dates in initial email exchanges as well so that everyone could get these on the family calendars. 3. Read the book, too. We selected The Chocolate Touch as our first book. It's a good book that mirrors the story of King Midas. 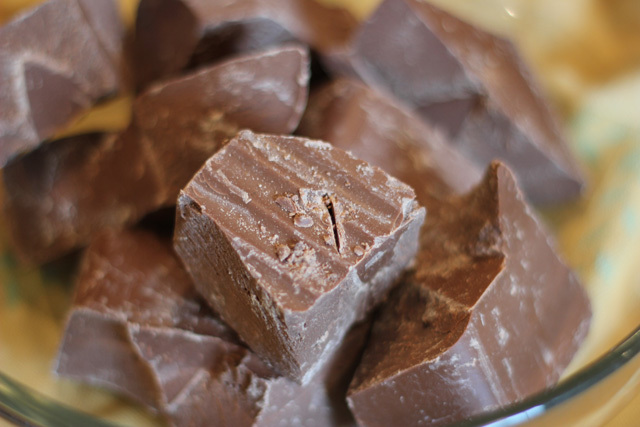 The protagonist John Midas gets the chocolate touch and turns everything into chocolate...even his mom! My daughter finished the book in one afternoon because she was so excited about it, and I wanted to be able to talk about the details with her and her friends so I devoured it, too. While you're reading, jot down a few notes and a handful of discussion questions. If you feel stumped on what to ask, simply Google a synopsis of your chosen read. Someone has already created the questions. Trust me. 4. Make it easy to enter the conversation. M made packs of numbers 1-4 for her friends. Our first question: How would you rate the book? (We do this without the props in my bookclub as a way to begin the book talk) The girls shuffled through the numbers, looking for 4s if they loved it and 1s if they never wanted to read it again. I asked them to turn their chosen number face down and on the count of three - we all revealed our ratings! First question, why did you give the book this rating? I loved that we had variance in opinions and great reasons to back up their thoughts! We breezed through the events of each chapter, with each girl clammoring to tell what they loved best about the characters and details. At the end of the discussion, I asked each girl to re-rate. One bumped her rating of a three to a four after the conversation! 5. Fun is a must. We want children to connect joy and reading together so let's make it fun. Think about how food can be themed for the event. 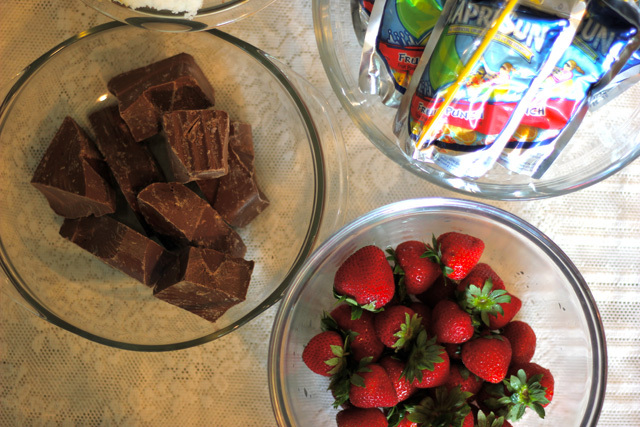 The Chocolate Touch lent itself to great chocolate treats such as strawberries and angel food cake dipped in a chocolate fountain. Throw in a craft, too! I wanted M to have full ownership of the meeting so we imagined together what kind of project would fit well with the plot of the book. 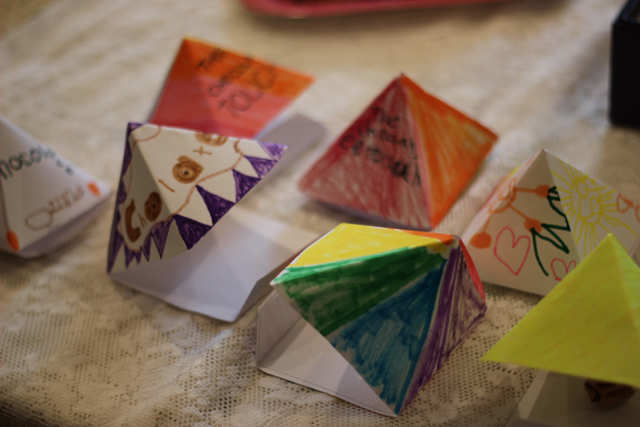 We decided on a chocolate box but put a twist on it by folding a pyramid-shape! Super cool and easy. 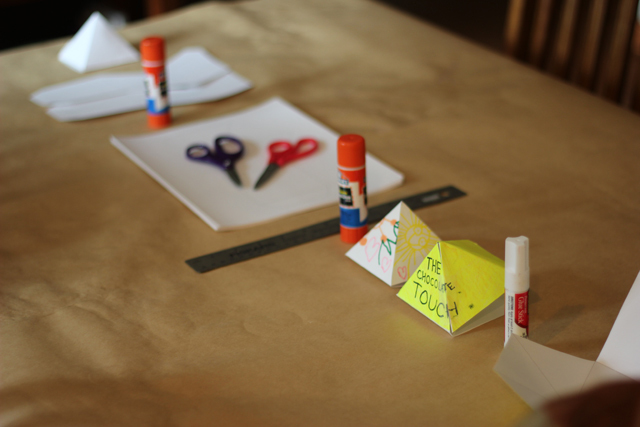 Check out this site for lots of box templates easy enough for kids (and busy moms) to follow. After two hours of pizza, talk, and chocolate, with full stomachs and high-pitched giggles, we said good-bye to great friends and avid readers. Next month we read Mrs. Piggle Wiggle, and M is so excited to plan our menu and gather the craft supplies. I'm already behind her in my reading...just as I had hoped. Hosting a bookclub for your child requires a little bit of energy, but it opens up some great paths into literature and relationships for your little one. Any great children's reads that you'd recommend? 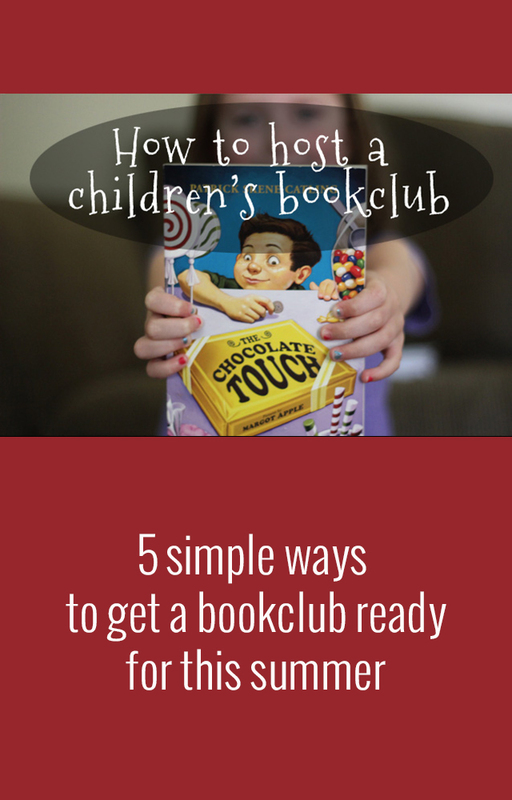 Would you have wanted to be a part of a bookclub as a child?